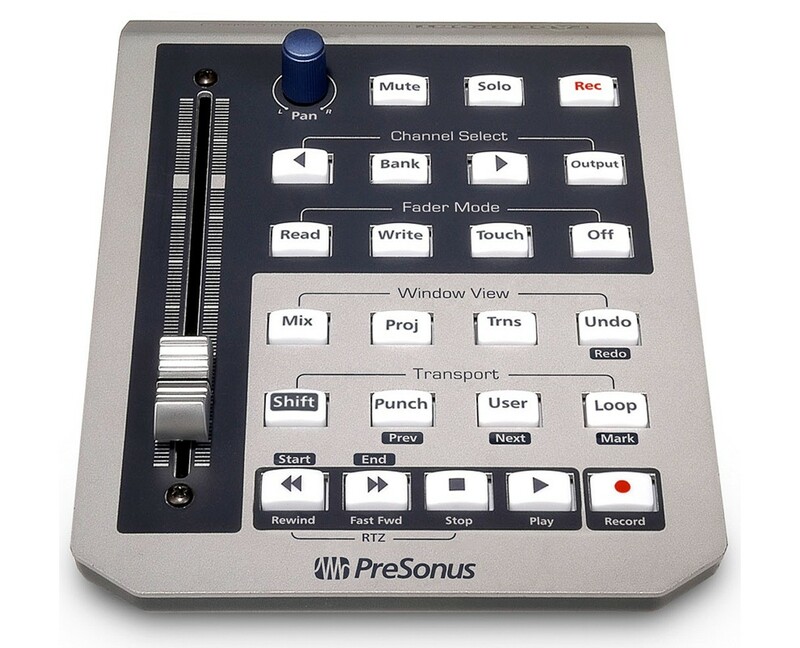 FaderPort Classic, Motorized MIDI Control Surface from PreSonus in the FaderPort series. 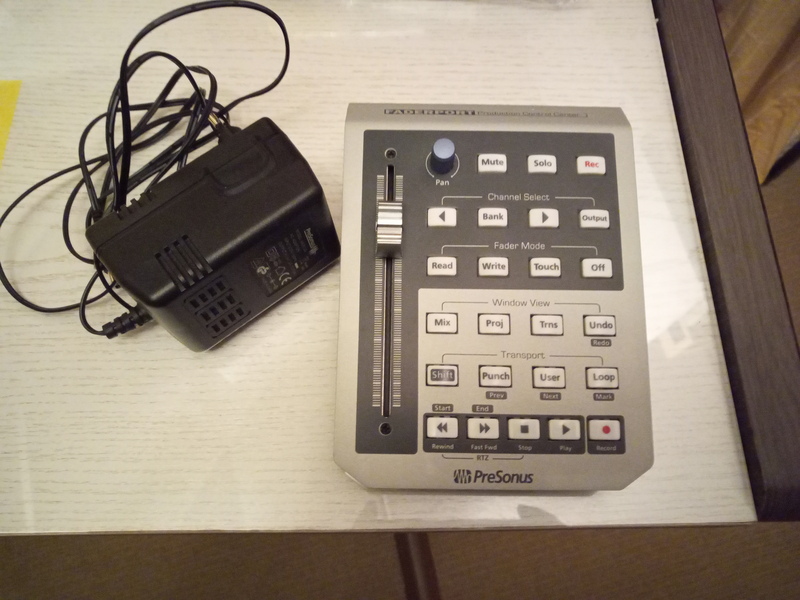 sw80's review"Connect it and use it"
The PreSonus FaderPort is a 1 channel USB Fader that has transport controls. It only cost 129 and can be purchased at almost any retailer online or in store. For it to be such a low priced unit, it sure is well built. It was a lot heavier than I thought it was going to be, I expected a cheap plastic feel to it, but I was wrong it is nice and heavy. The FaderPort has Pan control, record enable, mute, and solo on it. There is also a foot-switch port (foot-switch not included) for punching in and out quickly and hands free. The FaderPort will work with your Mac or PC. I have used it on my Windows 7 system and on my Macbook and it never gave me a problem with either one. I have used it with a number of different DAWS and it seems to work great with whatever I use it with. I use it the most in Logic Pro though. You just connect the FaderPort to your computer through USB and start using it. It is very simple and just in case you need the manual it does come with one that is easy to understand and use if you need it. This device is very portable and can be taken with you wherever you need it to be. That is the reason why I was sold on this one because it seemed to be more portable and plug and play like than some of other ones that I have used. There are not tricks with the FaderPort, it works exactly like it is suppose to and it is truly plug and play (once you have the drivers installed which only take a few minutes). It is not an interface, there are no ins and outs on it. 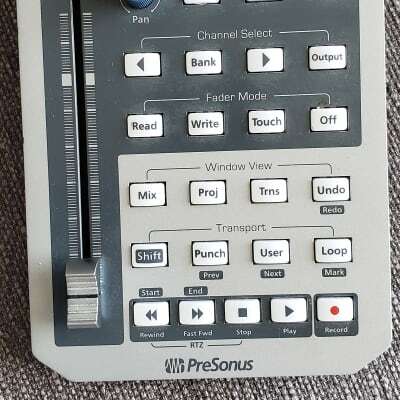 It is strictly a 1 channel fader. 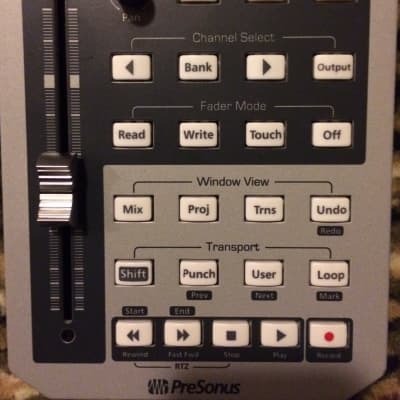 So if you already have an interface and just need a fader with transport controls you won’t find any other ones that are built like this for this price. It is a must buy. The faderport is a compact desktop daw controller with a motorized fader for automation. I switched to this unit from the behringer contril surface bcf2000. 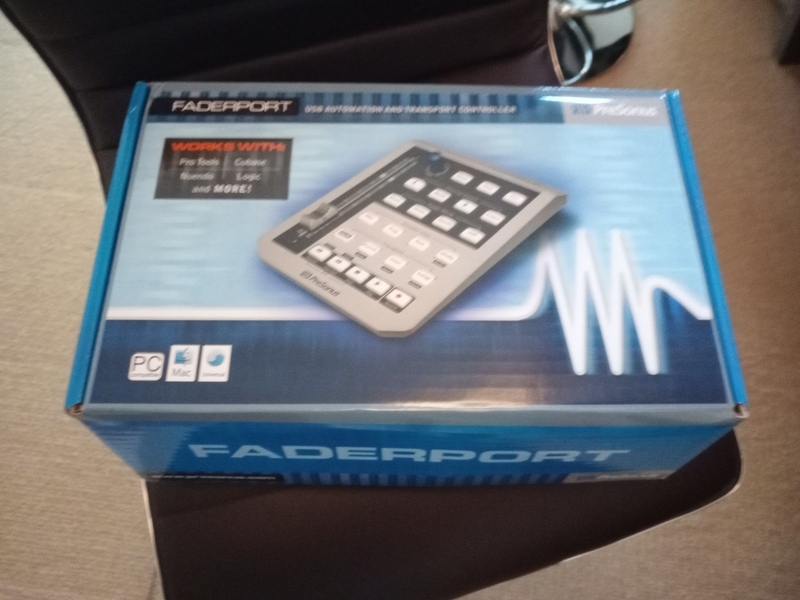 The faderport is $129 brand new, I got it for $80 off craigslist. Though the bcf2000 has 8 motorized faders, no led screen to know what track you are on can get confusing when banking through tracks. Since the faderport only has one fader I always know what track I'm on. The unit has a nice compact size to it. It doesn't take up much space on my desk. The fader feels good and responds well. I've tested it with Logic 8 and Pro Tools 8. Works great in Logic! and is very easy to set up. Actually there is no set up. Logic sees it upon starting the program and your good to go. 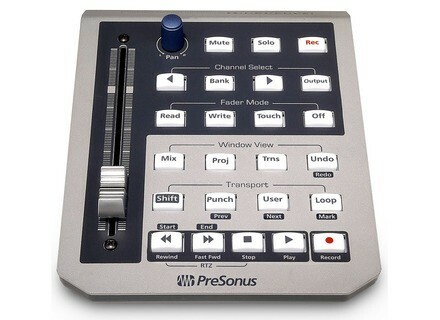 Way to go presonus. Pro Tools has dedicated mix and edit which are really nice if you main DAW is pro tools. 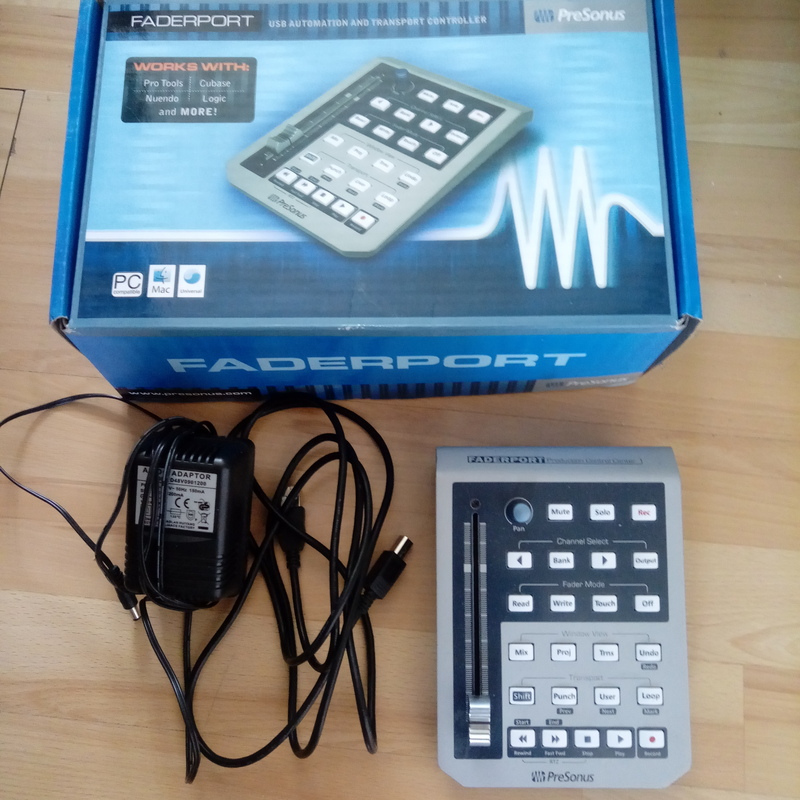 The fader response is the second best I've seen on a control surface, the first would be the euphonix controllers, which are way more in price to the faderport. So for the price I feel you can't beat the faderport. Logic worked great Pro Tools however acted a little funny, as expected. Since the faderport tricks Protools into thinking its a HUI device (which is the protocol Pro Tools uses for its control surfaces) I didn't expect it to work flawlessly. Sometimes buttons won't respond and I have to unplug the usb connection to restart the unit. Also the buttons feel stiff to me, this may get better after continued use. My final gripe is firmware update process. I downloaded the newest drivers and tried to check the firmware but that turned out to be frustrating, the unit just react like the manual said it should for when checking or installing the latest firmware. Build quality is nice, besides the stiff buttons I do not have any complaints. for $129 for a motorized fader you can not beat the faderport. Since it has one fader you always know what track your on. Also note that the motorized fader will not work unless its getting electrical power, however the unit will work with just usb power. This is a great way to do some manual automation with a fader for an affordable price. I Read up on this item an decided to give it a try. This being my first presonus component. The drivers that come with it just do not work on some daw platforms. Mine being cubase studio 4.1. Just had some very weird reactions. At any rate the unit is very sturdy and the slider is smooth and all buttons solidly built. 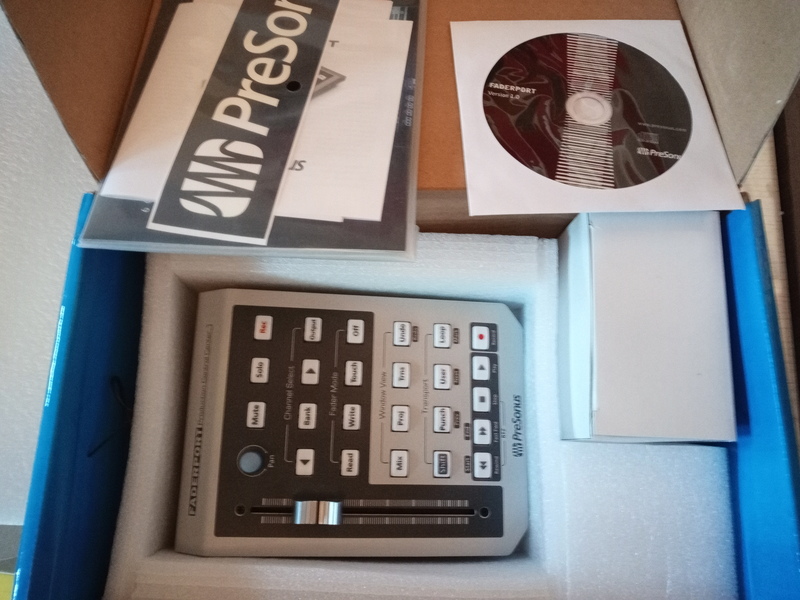 Contacted presonus about the problem, after a little prying I got them to send me a v1.2 beta driver for my cubase system. Everything works as it should after the update. I'm told when cubase did thier update, they changed some coding that presonus had to then rewrite the drivers to correct. At any rate, after that rocky start, this has to be the best thing other than growing another hand! It's very intuitive to use (and I'm left handed) the touch sensitive slider saves tons of mousework on volume control and the other controls are very usefull to speed up the workload. Highly recommend this item, but make shure you don't get frustrated out of the box until you get the correct updated driver. All of the features work very well except for the pan control. It is either very jumpy or very precise, and sometimes jumps between being both. The only other thing I see wrong with the faderport is that the fader scrapes against the sides (very slightly) when reading automation. This doesn't seem to have any negative effects besides being slightly annoying. Other than that it works flawlessly, and responds instantaneously, which is the most important factor. This is an excellent product. FaderPort utilizes the same ultra high-quality Alps fader that is used in professional control surfaces and digital mixing consoles costing 200 times the price including DigiDesign's D-Command. The fader is very high quality and performs as promised. I only need, and would rather have, one very high quality fader than multiple lesser quality faders. Des notes et du bruit's review"The basic needs"
I've had it for three weeks. I just looked at the bcf 2000, but I did not need as many faders. I like: the motorized fader, the fact that it takes little room, the whole "all in one" concept, its simplicity, robustness, its look. I dislike: having some troubles to make it work with Live (you have to carrelully follow all the steps), the pan knob &nbsp;infinite that is not precise enough. I would buy it again without hesitation, very good value for money.